Spencer Massey raced to his second consecutive win of the season Sunday at the NHRA SuperNationals at Old Bridge Township Raceway Park. Mike Neff (Funny Car), Allen Johnson (Pro Stock) and Matt Smith (Pro Stock Motorcycle) also won in their categories at the eighth of 22 events in the NHRA Full Throttle Drag Racing Series. Massey drove his FRAM/Prestone dragster to a winning 3.821-second run at 319.07 mph to beat Top Fuel points leader Del Worsham on a holeshot. It was Massey’s second consecutive win of the season (Topeka) and fourth of his career. Worsham kept the points lead with his fourth final round appearance of the season, while teammate and defending event winner Larry Dixon moved around seven-time world champion Tony Schumacher to take over the second-place spot in the point standings after his semifinal round appearance. In Funny Car, Neff held off No. 1 qualifer Cruz Pedregon to grab his second win of the season. Neff drove his Castrol GTX Ford Mustang to a 4.071 at 314.09 winning run after Pedregon posted a red light start. It was Neff’s third career win and fourth consecutive final round appearance for the season. The win strengthened Neff’s points lead over the Funny Car class, while Pedregon fell just seven points from moving up to the third spot in the point standings. Pro Stock’s Allen Johnson held off rookie sensation Vincent Nobile to pick up his first win of the season. Johnson drove his Team Mopar/J&J Racing Dodge Avenger to a 6.689 at 210.64 for the win after Nobile posted a red-light start in the final round. It was Johnson’s ninth win of his career. The win moved Johnson up to seventh in the point standings, while leader Jason Line kept control of his points lead over the category with his second round appearance. In Pro Stock Motorcycle, Smith on his Al-Anabi Racing Buell held off points leader Karen Stoffer to grab his first win of the season. Smith’s run of 6.900 a 191.73 was enough to beat Stoffer on a holeshot and give the 2007 world champion his first win of the season and 13th win of his career. The NHRA Full Throttle Drag Racing Series will return to action at the Ford NHRA Thunder Valley Nationals presented by Tri-Cities Area Ford Dealers, June 17-19 at Bristol Dragway. Final finish order (1-16) for professional categories at the 42nd annual NHRA SuperNationals at Old Bridge Township Raceway Park. The race is the eighth of 22 events in the NHRA Full Throttle Drag Racing Series. 1. Spencer Massey; 2. Del Worsham; 3. Larry Dixon; 4. Brandon Bernstein; 5. Doug Kalitta; 6. Morgan Lucas; 7. Tony Schumacher; 8. Antron Brown; 9. David Grubnic; 10. Bob Vandergriff; 11. Shawn Langdon; 12. Dom Lagana; 13. Fred Farndon; 14. Doug Foley; 15. 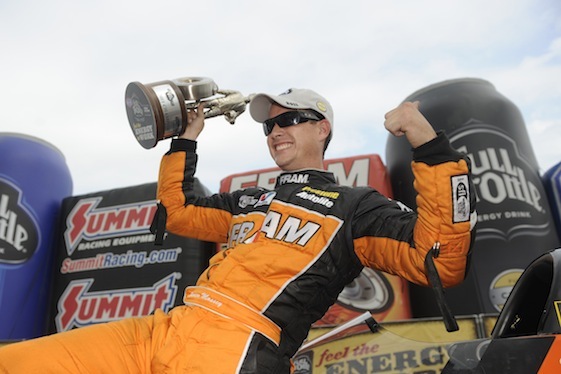 Clay Millican; 16. Terry McMillen. 1. Mike Neff; 2. Cruz Pedregon; 3. Ron Capps; 4. Matt Hagan; 5. Johnny Gray; 6. Jack Beckman; 7. Melanie Troxel; 8. Tim Wilkerson; 9. John Force; 10. Bob Tasca III; 11. Jeff Arend; 12. Jim Head; 13. Robert Hight; 14. Tony Pedregon; 15. Paul Lee; 16. John Smith. 1. Allen Johnson; 2. Vincent Nobile; 3. Greg Stanfield; 4. Mike Edwards; 5. Erica Enders; 6. Jason Line; 7. Rodger Brogdon; 8. Shane Gray; 9. Greg Anderson; 10. Ron Krisher; 11. V. Gaines; 12. Steve Kent; 13. Bob Benza; 14. Kurt Johnson; 15. Ronnie Humphrey; 16. Larry Morgan. 1. Matt Smith; 2. Karen Stoffer; 3. Jerry Savoie; 4. Andrew Hines; 5. Michael Phillips; 6. Eddie Krawiec; 7. Jim Underdahl; 8. Justin Finley; 9. Angie Smith; 10. GT Tonglet; 11. Chip Ellis; 12. Hector Arana Jr; 13. Mike Berry; 14. LE Tonglet; 15. Hector Arana; 16. Junior Pippin. Top Fuel — Spencer Massey, 3.821 seconds, 319.07 mph def. Del Worsham, 3.815 seconds, 322.19 mph. Funny Car — Mike Neff, Ford Mustang, 4.071, 314.09 def. Cruz Pedregon, Toyota Solara, foul. Pro Stock — Allen Johnson, Dodge Avenger, 6.689, 210.64 def. Vincent Nobile, Avenger, foul. Pro Stock Motorcycle — Matt Smith, Buell, 6.900, 191.73 def. Karen Stoffer, Suzuki, 6.889, 194.74. Pro Modified — Danny Rowe, Chevy Camaro, 5.878, 245.99 def. Mike Janis, Ford Mustang, 5.981, 244.78. Top Alcohol Dragster — Duane Shields, 5.206, 277.20 def. Mike Kosky, 5.471, 262.74. Top Alcohol Funny Car — Frank Manzo, Chevy Monte Carlo, 5.456, 266.21 def. Mickey Ferro, Monte Carlo, 5.562, 259.91. Competition Eliminator — David Rampy, Bantam, 7.653, 137.95 def. Anthony Bertozzi, Roadster, 30.777, 45.08. Super Stock — David Rampy, Chevy Camaro, 10.292, 129.54 def. Bob Hochrun, Camaro, 9.782, 134.77. Stock Eliminator — Joe Santangelo, Chevy Camaro, 10.753, 114.98 def. Chuck Veach, Camaro, 11.559, 113.41. Super Comp — Dave Heuwetter, Dragster, 8.934, 174.50 def. Don Higgins, Dragster, broke. Super Gas — Mike Sawyer, Chevy Cavalier, 9.943, 157.98 def. Francis Ross, Chevy Camaro, 9.884, 167.53. Super Street — Eric Reiff, Olds Cutlass, 10.897, 123.69 def. Ryan Roberts, Chevy Monte Carlo, 10.869, 135.84. QUARTERFINALS — Bernstein, 3.825, 319.22 def. Schumacher, 4.884, 164.69; Worsham, 3.834, 319.52 def. Kalitta, 4.386, 245.54; Massey, 3.807, 320.51 def. Lucas, 4.507, 175.82; Dixon, 3.837, 320.28 def. Brown, 5.226, 140.27; SEMIFINALS — Worsham, 3.827, 319.37 def. Dixon, 3.814, 318.02; Massey, 3.825, 319.90 def. Bernstein, 3.845, 319.29; FINAL — Massey, 3.821, 319.07 def. Worsham, 3.815, 322.19. ROUND ONE — Tim Wilkerson, Ford Mustang, 4.093, 306.81 def. Tony Pedregon, Chevy Impala SS, 6.072, 112.53; Matt Hagan, Dodge Charger, 4.101, 303.64 def. John Force, Mustang, 4.128, 309.49; Cruz Pedregon, Toyota Solara, 4.141, 302.08 def. John Smith, Chevy Monte Carlo, 15.665, 63.44; Melanie Troxel, Solara, 4.071, 310.27 def. Paul Lee, Impala SS, 7.231, 69.43; Johnny Gray, Charger, 4.804, 274.39 def. Robert Hight, Mustang, 4.888, 227.80; Ron Capps, Charger, 4.116, 306.53 def. Jim Head, Solara, 4.565, 235.51; Mike Neff, Mustang, 4.079, 311.77 def. Jeff Arend, Solara, 4.173, 300.46; Jack Beckman, Charger, 4.112, 308.57 def. Bob Tasca III, Mustang, 4.139, 305.56; QUARTERFINALS — Capps, 4.132, 303.37 def. Wilkerson, 5.016, 154.67; C. Pedregon, 4.074, 305.84 def. Beckman, 4.179, 305.15; Hagan, 4.217, 241.15 def. Troxel, 5.011, 164.25; Neff, 4.083, 313.66 def. Gray, 4.149, 304.87; SEMIFINALS — C. Pedregon, 4.111, 284.62 def. Hagan, 4.314, 257.43; Neff, 4.067, 313.00 def. Capps, 4.185, 288.70; FINAL — Neff, 4.071, 314.09 def. C. Pedregon, foul. ROUND ONE — Vincent Nobile, Dodge Avenger, 6.554, 210.93 def. Ronnie Humphrey, Pontiac GXP, 7.073, 155.52; Greg Stanfield, GXP, 6.570, 210.05 def. Greg Anderson, GXP, 6.568, 210.97; Allen Johnson, Avenger, 6.536, 211.86 def. Kurt Johnson, GXP, 6.671, 209.43; Rodger Brogdon, GXP, 6.531, 211.26 def. Steve Kent, GXP, 6.590, 210.31; Erica Enders, Chevy Cobalt, 6.539, 211.13 def. V. Gaines, Avenger, 6.583, 210.37; Shane Gray, GXP, 6.562, 210.80 def. Larry Morgan, Ford Mustang, 9.664, 92.87; Jason Line, GXP, 6.526, 211.16 def. Bob Benza, GXP, 6.609, 209.01; Mike Edwards, GXP, 6.538, 211.76 def. Ron Krisher, GXP, 6.568, 211.49; QUARTERFINALS — Stanfield, 6.566, 210.70 def. Gray, 6.587, 211.03; A. Johnson, 6.533, 211.23 def. Enders, 6.547, 211.36; Edwards, 6.562, 211.13 def. Brogdon, 6.571, 210.67; Nobile, 6.568, 210.87 def. Line, 6.568, 210.67; SEMIFINALS — Nobile, 6.629, 210.83 def. Edwards, 20.995, 33.64; A. Johnson, 6.555, 210.70 def. Stanfield, 6.559, 210.87; FINAL — A. Johnson, 6.689, 210.64 def. Nobile, foul. ROUND ONE — Matt Smith, Buell, 6.861, 192.93 def. Angie Smith, Buell, 6.896, 190.19; Michael Phillips, Suzuki, 6.903, 197.36 def. LE Tonglet, Suzuki, 6.994, 188.99; Justin Finley, Suzuki, 6.976, 192.33 def. Chip Ellis, Buell, 6.957, 191.05; Andrew Hines, Harley-Davidson, 6.965, 191.02 def. Hector Arana Jr, Buell, 6.963, 190.30; Jim Underdahl, Suzuki, 6.925, 192.91 def. Hector Arana, Buell, 7.040, 190.48; Karen Stoffer, Suzuki, 6.870, 195.14 def. GT Tonglet, Buell, 6.929, 191.24; Eddie Krawiec, Harley-Davidson, 6.954, 195.65 def. Junior Pippin, Buell, 7.223, 180.84; Jerry Savoie, Suzuki, 6.898, 192.74 def. Mike Berry, Buell, 6.968, 188.96; QUARTERFINALS — Hines, 6.946, 188.46 def. Underdahl, 7.006, 188.86; Savoie, 6.966, 188.20 def. Finley, foul; Stoffer, 6.899, 193.57 def. Phillips, 6.917, 195.79; M. Smith, 6.920, 188.02 def. Krawiec, 6.959, 189.52; SEMIFINALS — M. Smith, 6.902, 191.84 def. Hines, 6.971, 191.19; Stoffer, 6.907, 194.32 def. Savoie, 6.928, 189.84; FINAL — M. Smith, 6.900, 191.73 def. Stoffer, 6.889, 194.74. 1. Del Worsham, 714; 2. Spencer Massey, 650; 3. Larry Dixon, 609; 4. Tony Schumacher, 597; 5. Antron Brown, 580; 6. Doug Kalitta, 468; 7. Brandon Bernstein, 391; 8. Morgan Lucas, 379; 9. Shawn Langdon, 369; 10. Terry McMillen, 330. 1. Mike Neff, 707; 2. Jack Beckman, 609; 3. Robert Hight, 570; 4. Cruz Pedregon, 563; 5. Matt Hagan, 481; 6. John Force, 418; 7. Jeff Arend, 416; 8. Ron Capps, 406; 9. (tie) Johnny Gray, 398; Bob Tasca III, 398. 1. Jason Line, 642; 2. Greg Stanfield, 585; 3. Greg Anderson, 571; 4. (tie) Mike Edwards, 545; Vincent Nobile, 545; 6. Rodger Brogdon, 512; 7. Allen Johnson, 471; 8. Erica Enders, 421; 9. Shane Gray, 404; 10. Ron Krisher, 360. 1. Karen Stoffer, 380; 2. Andrew Hines, 337; 3. Eddie Krawiec, 311; 4. LE Tonglet, 273; 5. Matt Smith, 252; 6. Hector Arana, 239; 7. Jerry Savoie, 238; 8. Michael Phillips, 193; 9. Jim Underdahl, 186; 10. Hector Arana Jr, 148.